Apple Week has been a hit at our house! Our favorite activity was apple stacking and snacking, which I'll tell you about tomorrow. We also made a spin art apple banner and did an apple math activity. 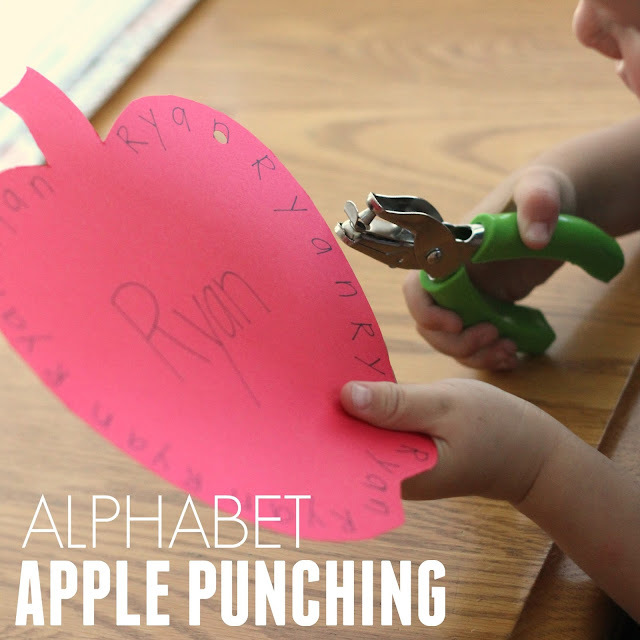 Today the kids grabbed hole punchers and we did some alphabet apple punching. We were inspired by this find the letter on the pumpkin activity created by Hands On As We Grow. 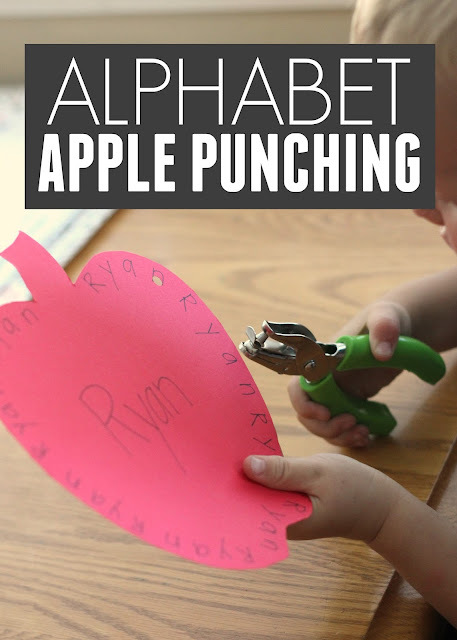 Get started by cutting out a big apple from a piece of cardstock. You can use the small template I gave you and enlarge it, or just do it small if you don't want to draw your own apple. Next, decide what letters you are going to practice. My son LOVES his name and likes exploring the letters in his name. We decided to use his name for our alphabet punching activity. I wrote his name in the middle of the apple and then repeated it around the edge of the apple again and again. Next I handed him a hole punch and challenged him to punch all of the "a"s. Then we tried punching all of the "R"s or I told him to "punch 3 letter n's." It was a challenge to get the hole punch centered right on the letter, so he tried his best and sometimes he got it close to the letter and sometimes it was high above or below the letter. It was adorable. I was really impressed with his concentration while he punched the different letters. I don't let my kids use hole punchers that often because ours are always getting lost. My little guy thought it was SO FUN. His little fingers got quite a workout too! Once we were finished we had a really hole-y apple! Here's a photo of us partway through the apple. Strong fingers muscles are important for writing. This activity is the perfect activity to help your child build up their stamina for writing. Our Virtual Book Club for Kids featured book this week is Ten Apples Up On Top by Dr. Seuss, so after we did some punching, we did some reading too! Make sure to head over to I Can Teach My Child today to see all of the letter activities that are shared as part of Jenae's Toddler Time series. You can also check out our alphabet apple stomping game that was a hit too.